Mr Fong holds the ‘MinION’ in front of the two larger sequencing machines used by the Massey Genome service. A Massey University genomics specialist has received an international award for developing a diagnostic technique for tuberculosis in Myanmar. 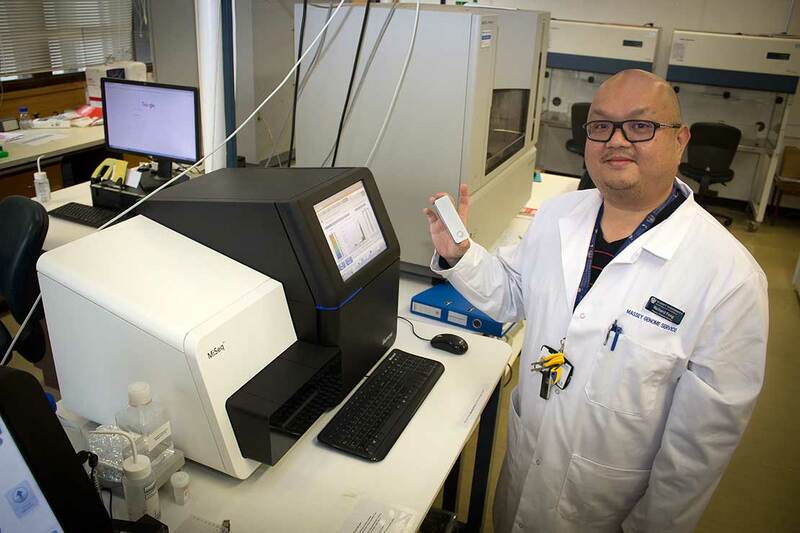 Massey Genome Service’s Mr Richard Fong received the award from Oxford Nanopore Technologies in the United Kingdom for utilising the company’s ‘MinION’ sequencer. The bacterial genome enrichment technique developed by the team is applied through the ‘MinION’ sequencing and Illumina MiSeq technology, which is much faster, cheaper and significantly smaller than earlier high throughput sequencers. Mr Fong says the technique used is able to reduce the time taken to diagnose multiple or extensively drug resistance strains of tuberculosis (TB), which the team hopes to apply in Myanmar. “Faster treatment is possible because you can generate an incredible amount of sequence data with ultra-long read lengths in real time so that analysis can be performed onsite,” he says. Myanmar is one of 14 countries that is present in all three of the World Health Organisation’s (WHO) lists for a high burden of TB, TB-HIV, and Multiple Drug-Resistant TB, with an annual mortality rate of more than 26,000 cases per year and 9,000 new cases of MDR-TB per year. Mr Fong says; “The award highlights the importance of New Zealand research and its genomics capability in helping to eradicate the world’s number one killer disease – tuberculosis. If successful our novel approach will be a game changer in the treatment of tuberculosis worldwide as it will provide a much faster evaluation of drug resistance profile in TB”. The tool weighs less than 100 grams and plugs directly into a laptop. It requires no additional computing equipment, which makes it more suitable for on-site diagnosis so that patients can get treatment fast. Mr Fong is working alongside Professor Peter Lockhart of Massey’s Institute of Fundamental Sciences, and Otago University’s Myanmar research fellow, Dr Htin Lin Aung, and Professor Gregory Cook. Both Mr Fong and Dr Aung will travel to Myanmar later this year to test out the tool and protocols in the field. The researchers are further discussing research collaboration between New Zealand and Myanmar scientists. Dr Aung says he is proud to be involved in this research project that could benefit his home country and New Zealand. The team hopes that the techniques being developed might also be applied to other priority infectious diseases such as HIV (AIDS), Influenza and Malaria.